Click the SSH button to connect to your website’s server. After executing these commands, your certificates will be generated. Take note of the directory where your certificates are installed. The next step is to configure your certificates. First, execute the command below to open your default-ssl.conf file for editing. At the top of the default-ssl.conf file, paste the following lines of code in order to tell your server to direct network traffic to HTTPS port 443. The next step is to use the down-arrow key to scroll down towards the bottom of the default-ssl.conf file. 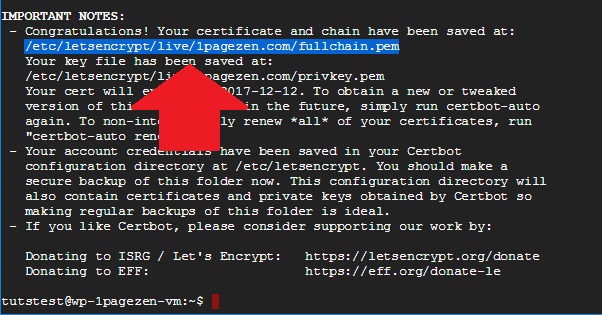 Place a # sign next to the existing snakeoil certificates, and paste the path to your three SSL certificate files as shown in the command below, making sure to replace 1pagezen.com with your own domain name. The next thing you will do is configure your Apache server to only serve the HTTPS version of your website. To do this, you will edit your wordpress.conf file, which you can access by executing the command below. 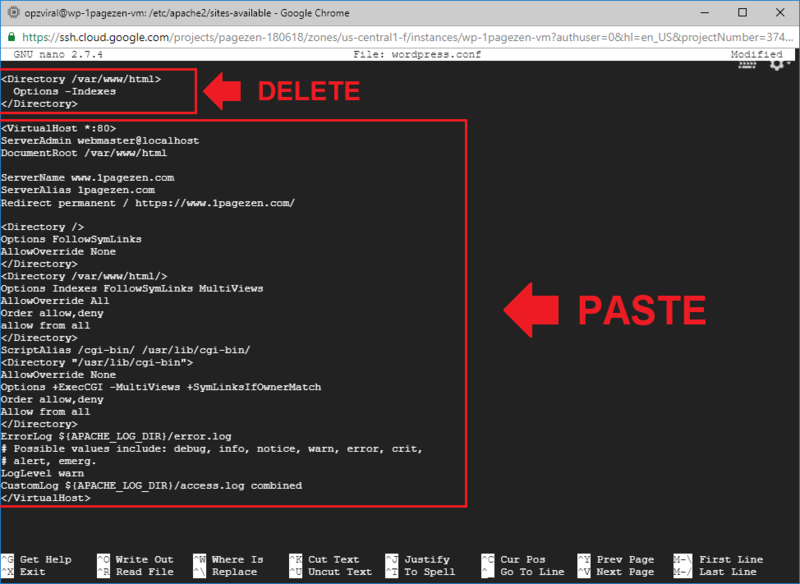 Inside of the wordpress.conf file, delete the existing 3 lines of code at the top of the file. Then, copy and paste the code below into the file - remembering to replace 1pagezen.com with your own domain name. After adding the code to your wordpress.conf file, enter ctrl+o to save your changes and ctrl+x to exit the wordpress.conf file. In order for your certificate changes to take effect, you need to update/restart you Apache server by executing all three of the commands listed below. In your browser, enter the URL (with https://) to your wp-admin dashboard. From your WordPress dashboard, navigate to Settings > General, and replace your current domain name with the https:// version - with or without www. infront. Then, scroll to the bottom of the page and click the Save Changes button. Do you want your SSL certificates to renew automatically? In the following steps you will learn how to configure auto-renewal for your SSL certificates - so let's get started! The first step in configuring auto-renewal is to use the mv command to move your certbot package into the letsencrypt directory. You can verify that your certbot-auto package has been moved successfully by executing the command ls /etc/letsencrypt/ and seeing if the certbot-auto package appears in that directory. Now that you've moved your certbot-Auto package to the /etc/letsencrypt/ directory, the next step is to open your crontab file. 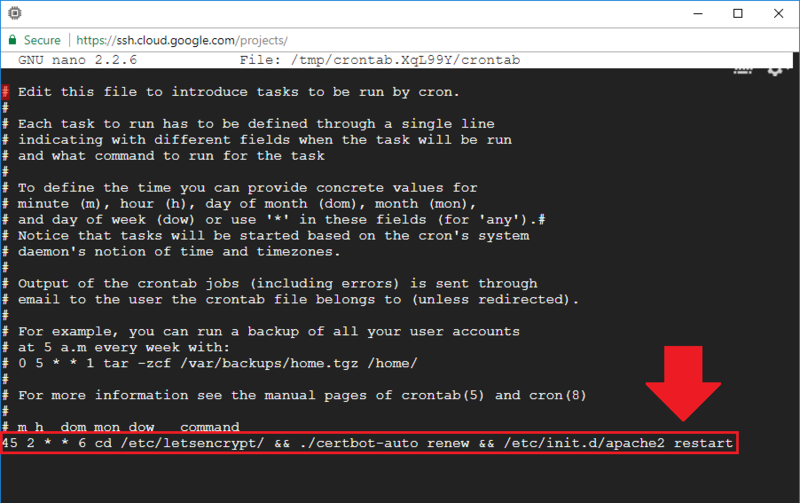 You can open your crontab file by executing the command sudo crontab -e.
Now that you've opened your crontab file, the next step is to add a script at the bottom of the crontab file which will execute once per week and will automatically renew the SSL certificates if they are about to expire. At the bottom of your crontab file, you will enter a script which will tell your server to check for certificate renewals once per week, and to automatically renew the certificates if they are about to expire. After adding the script, save the crontab file by pressing CTRL + X, then Y, then Enter. If you're interested in learning about additional auto-renewal testing methods, check out the full Certbot auto-renewal tutorial here. 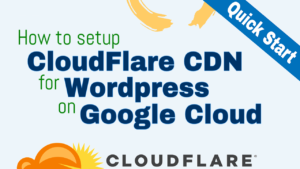 You may also be interested in boosting your website's performance by configuring Cloudflare's free CDN. Thank you for the tutorial. It has been very helpful. For the last one year I have been running https without any issues. However, it seems my certificates did not auto renew and my site is down view invalid certificate. Try following the instructions from the error message to create a temporary swap file. Try renewing again after creating the swap file. I followed the instructions from the error message and I was able to renew the certificates. Thank you for your help. You are doing a tremendous job. google cloud micro-f1 VM, running ubuntu minimal 16 something LTS (configured within google cloud). Installed wordpress with docker-compose tutorial. WordPress site is running, can add plugins, posts, pages, so it’s ok. I haven’t tested this tutorial with WordPress running in containers – so I’m not sure the solution. Try checking if /var/www/html/ exists as the webroot, as the directory structure may be entirely different. This really helped me a lot and was so straight forward. But after installing a second website on Google click to deploy, I am having trouble setting up SSLs for that as I get a conflict. Can you do a tutorial or help me out? Alternatively, I tried installing a site to a subfolder on the main website, however, I am having trouble pointing a domain to that folder. Are you using WordPress multisite? If not, I’d recommend doing so if you’re configuring multiple WordPress websites on the same machine. To do this with Click-to-deploy, it would be more complex, but you could potentially set up separate virtual hosts for each of the WordPress installs and then use a single SSL certificate to handle SSL for each of the domains. Hi I have followed everystep carefully but now I am not able to open my site with either http or https. This sounds like a networking error; which usually are caused by an IP address mismatch between your CloudDNS and your Google Cloud instance. Please check the comments to this tutorial for potential fixes. Hello, can someone help me out with this error message I get every time I try to run the Apache restart command. I have tried deleting the instance and reinstalling at least 5 times now, and still no luck. Thank you for your help! — Unit apache2.service has begun shutting down. Feb 26 04:10:38 incki-test-wordpress-vm apachectl: Action ‘stop’ failed. Feb 26 04:10:38 incki-test-wordpress-vm apachectl: The Apache error log may have more information. Feb 26 04:10:38 incki-test-wordpress-vm systemd: Stopped The Apache HTTP Server. — Unit apache2.service has finished shutting down. Feb 26 04:10:38 incki-test-wordpress-vm systemd: apache2.service: Unit entered failed state. Feb 26 04:10:38 incki-test-wordpress-vm systemd: apache2.service: Failed with result ‘exit-code’. — Unit apache2.service has begun starting up. Feb 26 04:10:38 incki-test-wordpress-vm apachectl: Action ‘start’ failed. Feb 26 04:10:38 incki-test-wordpress-vm systemd: Failed to start The Apache HTTP Server. I went through all the steps and got stuck when i left the ssh console. When I try to access my site or the site admin panel using http or https, the connection times out. I have https traffic allowed. I’m not sure how to proceed. Thanks for any help. Is your website still down? One important note – this caused me lots of headache. The files here are what must be pasted in step 4! You have 3 files, but certbot only created two for me. This caused Apache to not restart and the site to do down. Firstly, let me say thank you for the amazing tutorial. However when I type in https://www.sytes.co.uk/wp-admin to login to my site, it has the full SSL with the green padlock. I’m glad to hear you’ve enjoyed the tutorials – thanks for the feedback! It sounds like a ‘mixed content’ error. I’d recommend checking out this tutorial for instructions on how to fix the issue. Thank you for your amazing job making this tutorial. Your server is attempting to use HTTPS without a valid certificate – which is what is causing the error. In order to validate your domain, certbot sends a request to your domain – and if it can’t access your domain (which it can’t in this case due to the HTTPS error), then certbot will throw an error. To fix this problem, you need to remove the HTTPS redirect (the three lines of code toward the top of the wordpress.conf file which start with ServerName), which were added in step 5 of the tutorial. Next, you will have to uncomment the snakeoil certificates, and comment the SSL certificates – basically a reversal of the second part of step 4 of the tutorial. After doing this, try to run the certificate issuing command again. will it work for wordpress installed via runcloud (free version)? I have not tested this tutorial with runcloud – but it’s possible that other users have. This is simply awesome. I have learnt many things for all your tutorials. Thanks a lot for sharing this. I am able to do the configuration of three SSLs on the single IP with this tutorial. Thanks again. Just wanted to check what is validity of this SSL and is auto renew is compulsory to do. Jan 31 03:46:56 bhp-wp-vm apachectl: Action ‘start’ failed. Jan 31 03:46:56 bhp-wp-vm apachectl: The Apache error log may have more information. Jan 31 03:46:56 bhp-wp-vm systemd: Failed to start The Apache HTTP Server. There is a syntax error on line 225 of your apache2.conf file. To fix the problem, open the apache2.conf file, then jump to line 225 by following the instructions here. Then, identify the syntax error, save the file, and restart Apache. There were multiple comments on this date which referenced this issue. It looks like it was a temporary issue with Certbot; were you able to get the issue resolved? I have an issue after following your tut and got to changing the “WordPress” and ‘Site’ Url. No the server does seem to respond. Here is the link to a more full description of my proplem. It looks like you were able to get the issue resolved based on the answer to this question here. It looks like you were able to get the website working – what was your solution? I am asking because I’ve seen a couple of recent comments from users with the same issue. I noticed numerous comments from other users who were experiencing a similar issue – were you able to get it resolved? I tried using this tutorial, it turns out well but at certain instances i keep losing the green lock. Any help? If the green lock is disappearing on certain pages – that may be caused by insecure content errors. Check out step 1 of this tutorial on how to resolve insecure content errors. i followed all your instructions to this stage of command sudo nano /etc/apache2/sites-available/wordpress.conf to edit the wordpress.conf file but the problem i have is confusing because in your tutorial after executing the command its suppose to come up with three lines of code to be deleted but on my server i have more than three lines making it difficult to identify the files for deletion. I dont want to mess things up since i cant identify the lines to be deleted how can you help. The older Click-to-deploy WordPress configuration file has many lines of code, whereas the new configuration only has a few. Just make sure the contents of the file match the instructions as provided in the tutorial. First of thanks for such great and helpful tutorials, who have made our life very easier, especially of a guy like me who doesn’t know much about this stuff. Here’s one problem, i have recently migrated my website http://www.palbrosinfotainment.com which i transferred from a free hosting site to GCP after watching your tutorial last year in mid of 2018.
few days ago, my free tier plan had got exhausted and then i had to migrate my website from their. i have again signed up for GCP(With someone else’s details :)). I watched somebody’s video on youtube about how to migrate manually with help of duplicator plugin. i followed all the steps that were shown in the video and now i am able to access my website. But this time there are few problems that i am facing. 1. i followed all the instruction for SSL certificate that you told in the tutorial and i received success messages also during installation time but my website is still showing unsafe http. 2. There are few plugins on my website which when i am trying to delete not getting deleted , getting server busy and try later error. I am in serious need , don’t know what has happened and how to solve it. I took a look at your website’s SSL configuration and it’s showing that your website is using placeholder certificates. I would recommend going back through the tutorial and checking if your configuration files match the directive outlined in the tutorial. Let me know if you have any questions, and talk to you soon. What is placeholder certificate ? How to check the configuration files? The placeholder certificates exist in the Bitnami WordPress stack – which makes me think you may have used the wrong tutorial. Configuring SSL for the Bitnami version of WordPress on Google Cloud is an entirely different process than Click-to-deploy. The configuration files are the files that end with the .conf extension – they are edited several times throughout the tutorial. First of all thanks a lot for these prompt responses, are really helpful. Actually i have commented on this tutorial page but actually i had followed bitnami one only(the one you have suggested). I again followed the same process, skipped step no.6 as recommended on the website. There is one step in the tutorial when we have to replace two instruction in wordpress configuration file, i saw the instructions were already the correct one their. I must tell you that i am also using one plugin on this site that is Really Simple SSL could that be the reason, i thought and then i uninstalled that but still nothing changed my site is still not reflecting HTTPS. Please see if still you can help me out in this. It looks like you were able to get the issue resolved. Please reach out if you have any questions or concerns! I don’t know how but my issue has got resolved. Hello there! Thank you for your tutorials. now I can’t access my website (statnote.com) or wp-admin. Also, the four commands that you executed in attempt to fix the problem likely broke the system configuration beyond repair. I would recommend restoring the website from a backup if you have one available. Otherwise, you’re in for a long troubleshooting journey ahead. Thanks for the tutorials they are very useful. I completed the SSL steps but can only access mysite/wp-admin using unsafe mode in Chrome. It is showing as not secure and if I try without safe mode I get ERR_CERT_COMMON-NAME_INVALID. Did I miss something? Hi Graeme – it looks like you were able to get it working! What was the problem? THANK YOU SO MUCH, I ran thru this ARTICLE LIKE 10 TIMES, BUT FINALLY IT WORKED!!! SO APPRECIATIVE WHAT YOU PUT OUT HERE!!! Thanks Jennifer – glad to hear you were able to get the certificates working! I restore my Joomla websites under /var/www/html folder, as per your instruction, when go to sudo nano /etc/apache2/sites-available/ I only find 3 files, 000-default.conf, default-ssl.conf, and lamp-server.conf, which file will I edit and add the following code? These instructions have only been tested with the WordPress Click-to-deploy solution. Try using the generic Certbot/Let’s Encrypt installer available here. Select your server (Apache), as well as your operating system, which you can find on your solution’s deployment page. Did you make sure to replace 1pagezen.com with your own domain name in the certificate issuing command? If you didn’t, you will have to change the command and re-issue the certificates. I’m not sure what the issue is, but it likely has to do with your DNS configuration. First, make sure that your website is accessible via HTTP using your domain name. It needs to be working beforehand, as it is required as part of Certbot’s domain validation process. Further, do a Google search for “DNS problem: SERVFAIL looking up CAA” – I recently performed this search and found plenty of resources from Let’s Encrypt with instructions on how to fix the error. We followed your instructions to the T, confirmed that everything was done correct, however when done we cannot access the site. We get an error saying “This site can’t be reached” on the web browser. We truly do not know how to proceed. The only installation different was that we installed the one click multisite installation of wordpress through the market place. Go to your VM instances dashboard. Click on your instance. Next, click the ‘Edit’ button at the top of the page, then scroll down toward the bottom of the instance settings and make sure that the box that says “Allow HTTPS Traffic” is checked. Then click the “Save” button at the bottom of the page. I am not sure what this all means. I went ahead and restarted VM, but now can’t access website at all. I can’t access WP admin by ip either. Please advise, what can be done. Check the output from each of these commands in order to gather clues as to what’s causing your error. Your advise led to clues, which I was able to fix. Thank you. Now I have an issue with 301 redirects from http to https. I did follow your instructions from 301 redirect article, but no luck. If you visit inetcrypto.com, it will take you to a non secure site. I’m glad you were able to get the issue resolved! The 301 redirect article is for re-routing pages/assets that have been deprecated – it’s not for configuring HTTP to HTTPS functionality for your web server. Regarding your website, everything appears to be working fine. I noticed some ‘mixed content’ errors in the console, which I go over how to fix in step 1 of this tutorial. Regarding the menu links not working – check out this tutorial; you may have to update your WordPress menu links through the WordPress dashboard. Did u solve this ? Thank you for the tutorial video. After I followed and complete the your guideline steps, I tried to sign in “https://trendyls.com/wp-admin”. But, I couldn’t sign in the WP front end. It does not recognize the user name and/or password. I followed this below but it did work neither. If you migrated the site using the All-in-one WP Migration plugin, the password will be your original WordPress password – not the new one. If you didn’t migrate the site, open the GCP sidebar menu and navigate to Marketplace > Your Solutions, then click on the WordPress solution that you deployed: the username and password will be listed therein. Yes. I did migrate the site using the All-in-one WP Migration plugin. I have tried the password my original WordPress password again, but it did not take it. The issue is solved. I can sign in WP-Admin now. I have the Tech Support from All in One Migration sent me the reset password (adminer.php) file. No problem Tom – I’m glad you were able to get it worked out! Hi. Thanks for the great tutorial. Got my site secure. I have one issue though. Some of the pages (the homepage) show the full padlock on chrome and says ‘Connection is Secure’, however some of the other pages (how it works) show the exclamation point on chrome and says ‘Your connection to this site is not fully secure’. Suggesting that the images are not secure. Those are likely ‘mixed content’ errors. They are very common and occur when your website is using image links with an http:// instead of https:// prefix. I go over how to fix mixed content errors in step 1 of this tutorial. The error is presenting itself because you made too many certificate requests within a set period of time. You will have to wait awhile before trying to issue certificates again. My question is, is the method recommended by Certbot a better method? It has a lot less steps and also doesn’t require any manual editing of server configuration files. Also, will the changes we make to default-ssl.conf file, for example, not be overridden during an update/upgrade? I haven’t tested that method with Bitnami, but it should work just fine with Click-to-deploy. That being said, I can’t vouch for the auto-renewal configuration. Also, I haven’t had any issues with default-ssl being overwritten after an upgrade. If you give the install a try, let me know how it goes. It worked fine, Joe! I can’t thank you enough for the tutorials – you have helped me and many others immensely and may you be blessed in abundance for that! Thanks for the feedback and kind words Cricket – I’m glad to hear you were able to get it working! I can not update the URLs on my WordPress page because it no longer loads. No error appeared in the previous steps. Please help me. Use this workaround to temporarily force-change your URLs in order to access your dashboard again. Are you using the Click-to-deploy version of WordPress on Google Cloud? /var/www/html is the webroot of the Click-to-deploy version of WordPress on GCP. This directory doesn’t exist in the Bitnami version. If you can’t locate the directory, check out this tutorial of Linux commands, including commands for navigating your system’s directories. I have this problem as well. I used the click to deploy WordPress version, not the bitnami and I am unable to find the /var/www/html directory even after searching around in the shell with the directory commands. Did something change perhaps in the click to deploy image after this blog post? If this doesn’t work for you, it’s possible that you deployed the wrong image. 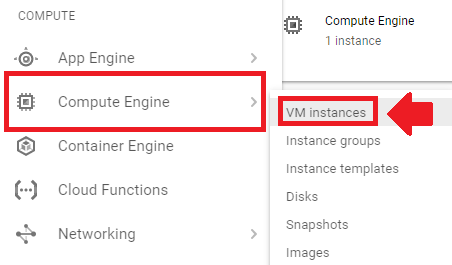 When you first deploy the WordPress Click-to-deploy image from the Google Cloud Marketplace, make sure that you deploy the Click-to-deploy ‘virtual machine’ option, and not the container option. To further elaborate, if you do a search for ‘WordPress Click’ in the Google Cloud Marketplace, you will see several WordPress Click-to-deploy options: they are all different. You need to deploy the ‘virtual machine’ option. I figured out the issue. D’oh on my part. I am using the correct Click to Deploy version of WP, however i was in the wrong SHELL somehow. If you click the dropdown on the SSH button on the instance page, and choose open in new window, you get to the right spot where the commands work. However, if you choose “view gcloud command” it’s opens up in the bottom pane of the window in a gcloud shell CLI environment. I was typing in all the commands successfully up until it couldn’t find that directory in the cloudshell CLI. Very confusing that you end up in 2 different environments. Perhaps the cloud shell is the hypervisor layer, and the other brings you directly inside the debian image OS. Not quite sure, but that solved things for me. Maybe that will help others who ran into the same issue and are definitely using the right click to deploy version. The tutorial was very objective and helped me a lot, thank you for sharing! Great work! hi joe. can you assist me step by step how to install DV ssl from CA? i assume that i just need to upload the 3 file and it will be jump to step 4 of your tuts. am i correct? also what is the command line for searching the path of the file that i just uploaded? by the way, your tuts is very helpfull on my first project. this is my second project on GCE. thank you so much. You are correct about the process. I had a similar question which I just recently answered – you can view it here. Hello, Along with the domain I purchased the SSL certificate in Namecheap. I am using WordPress click to deploy in compute engine. I have updated the name server, my site is running. Since I already have an SSL certificate how can I add my existing certificate to my WordPress site in compute engine. Please help me out. Start at step 4 of the tutorial after you’ve uploaded the NameCheap certificates to your server. The upload can be done via FTP, which I cover in this tutorial. Also, when you add the certificate file paths to your default-ssl.conf file in step 4, you will need to make sure that the file paths accurately reflect the correct paths to the NameCheap certificates on your server, not the path to the Let’s Encrypt certificates. I ran a test for your certificates and it appears that they’re configured correctly. The only issue I notice when I visit your website are some insecure content errors, which are a front-end problem and are unrelated to your server configuration. Check out this tutorial here where I go into details on how to address insecure content errors. I think I found a solution to my earlier comment. It’s not at all perfect because the “green lock” is still not showing – that’s another thing I’ll have to resolve. But at least my site is now loading *yey!*. This solved my initial problem… Your tutorials btw made my wordpress migration to GCP a smooth ride, thank you so much! Thanks for brining this to my attention! I appreciate you sharing your solution, as it brings an important issue to to my attention. In step 2 of this tutorial, it’s necessary to check the two firewall boxes to enable both HTTP and HTTPS traffic. I realize that these boxes are left unchecked by default, so I will revise the tutorial to emphasize their importance. Is there anything that I’m missing? Please help… Thank you! I am getting this error and I don’t know what I did wrong. Nov 01 17:26:02 elev8-vm apachectl: AH00526: Syntax error on line 42 of /etc/apache2/sites-enabled/default-ssl. Nov 01 17:26:02 elev8-vm apachectl: Action ‘start’ failed. Nov 01 17:26:02 elev8-vm apachectl: The Apache error log may have more information. Nov 01 17:26:02 elev8-vm systemd: Failed to start The Apache HTTP Server. Nov 01 17:26:02 elev8-vm systemd: apache2.service: Unit entered failed state. Nov 01 17:26:02 elev8-vm systemd: apache2.service: Failed with result ‘exit-code’. Can you help me fix it my site is not working right now? 1. Open your default-ssl.conf file again (sudo nano /etc/apache2/sites-enabled/default-ssl.conf) and scroll down to the line with your SSL certificate file listed SSLCertificateFile:/etc/letsencrypt/live/elev8expo.com/cert.pem and make sure there are not space after any of the 3 certificate-file lines. If there are, use the backspace button on your keyboard to remove the excess spaces. Save the file and restart Apache. Let me know which (if any) of these solutions work for you. I got through the main setup process, but ran into a snag with your instruction for auto-renewal. I executed the name change command, but hitting enter just re-shows the starting prompt. Ok – so what is the output when you run the ls command? I should also add – this was a TOTALLY new google cloud setup, the only thing we did prior to going through this SSL setup was to execute the one-click install WP VM instance. This said, there would be no reason for an existing cerbot scheme to already exist or have any additional configuration settings. Thank you this absolutely helped me! I am new to cloud hosting and it’s people like you that makes it easier and possible to enter a new market. Just one question I have that I don’t seem to find, we have SSL up now but that is not http/2, how do we enable HTTP/2 does that enable with load balancing? HTTP2 is a separate module that needs to be both enabled and added to your Apache configuration. I don’t have a tutorial on the subject now, but hope to have one shortly. In the meantime, check out this DigitalOcean article on the subject. Do note that the HTTP2 module is only compatible with the later releases of Apache (2.4.17+). I am getting the following code when trying to restart the server. This happens after editing the wordpress.conf file. It is very strage because it is working on another site I have befirst.one – but not on this one. I just revised the tutorial (take a look!) to account for the recent changes to the Click-to-deploy stack. Please go over the new tutorial and check that your configuration matches. Thanks Leron OnePageZen should be labelled Super Heros!!! Google should be paying you full time for this it’s really awesome huge huge thank you! and when i am restarting apache server its showing error in code. I go over a workaround in this comment. I just updated the tutorial. Please give it a look and let me know if you’re able to resolve your issue. how to protect wordpress website from hackers …. 2. Keep regular backups (snapshots) of your instance on Google Cloud, so that you can quickly restore your website in the case of an outage. 3. Use 2-factor authorization on all Google Cloud and domain name provider accounts. there is a issue with database connectivity after some days as you told to Kawish see below for reference,can you make another video as per with updated Click to deploy. I just updated the tutorial to make it compatible with the updated Click-to-deploy configuration. I have a question (that maybe you have already answered in another tutorial, but this is the one I keep coming back to so I figured it might be useful to know here for others.) This setup works wonders for how I have my website. I have moved to virutal hosting multiple sites under one instance. It seems that the last site I create the SSL certificate for trumps all others and everything starts to point to that folder instead. I would recommend adding all of your websites to a single certificate file, then configuring each site to use the same certificate. This will use less resources if you run a job to automatically renew the certificates. Regarding everything pointing to the new folder, this is an issue with your server configuration and is likely not related to the certificate itself. I didn’t even consider that as a possibility! I ran it once with my first domain I was testing, then ran it again with the second domain. So when I try the first domain (without typing httpS) it starts to redirect to the secure version and tells me that there’s a security issue… then tries to point to the second domains URL. So I configured my SSL setup is in correct. I am guessing that I can just -d domain1.com -d domain2.com to set everything up? I just realized though, it would require /var/www/html/domain -d domain1.com /var/www/html/domain2 -d domain2.com though right? Are you able to do additional paths for that? I would guess having it at the root domain (/var/www/html/) would cause all types of issues . Honestly, I wasn’t expecting it to be that complex… I don’t know why I was even expecting the SSL certificate would be magically available “by default”… well, maybe I’m just a newbie. I follow the first tutorial I found on the youtube channel at: https://www.youtube.com/watch?v=qEgTUL5ZLV4. Crucially, before realize there was a new tutorial, I followed the old one to the point of installing “git”… Curiously, when I’ve entered the “sudo -i” command, first I get a series of text with an error, but when i’ve enetered again, it magically “root” me. However, in this new tutoria I’ve discover that I don’t need to log in as root. I’ve recheck carefully everything, enter as root administrator again and cancel git. “Job for apache2.service failed because the control process exited with error code. “Sep 29 23:00:11 wordpress-1-vm systemd: Failed to start The Apache HTTP Server. Sep 29 23:00:11 wordpress-1-vm systemd: apache2.service: Unit entered failed state. Sep 29 23:00:11 wordpress-1-vm systemd: apache2.service: Failed with result ‘exit-code’. THANK YOU IN ADVANCE FOR ANY HELP OUT THERE GUYS! Glad the tutorial was helpful to you! Who is user pi? Is that your Linux user? It looks like the permissions for the user aren’t configured correctly. Check out this thread here for more information and a potential solution. Followed the step on second time and successfully added SSL on my wordpress site. Many thanks of your great work. Thanks for the feedback Nolan – I’m glad to hear the tutorial worked for you! The server is showing a dummy certificate that came pre-installed with the software stack. If the domain name is an alias for another website, then the domain alias should be added to the SSL certificate for the primary domain on the ‘other’ (main) website’s server. In this particular instance, the ‘SSL checker’ is still picking up on the dummy certificates – which indicates that the SSL certificates haven’t been added to your configuration file (wordpress.conf). I would recommend checking out this section of the Apache docs for information about configuring separate virtualhosts in order to serve content from multiple domains under a single IP Address. I followed the steps and now I can’t pull up the home page for my website, is there any way for me to delete the SSL Certificate and start over from the beginning? You can place a # symbol to the left of the certificate files in order to ‘deactivate’ them. You will also need to add the # symbol next to the https redirect at the top of the .conf file. You will also need to change your WordPress URLs back to http on your settings page. Big thanks! I was able to get my client website secured! I don’t see the stuff to put that code inside of… am I missing something? Unfortunately the Click-to-deploy stack was updated recently, and there have been some major changes. I am going to have to update the tutorial. In the meantime, try pasting the code from this comment into your wordpress.conf file. 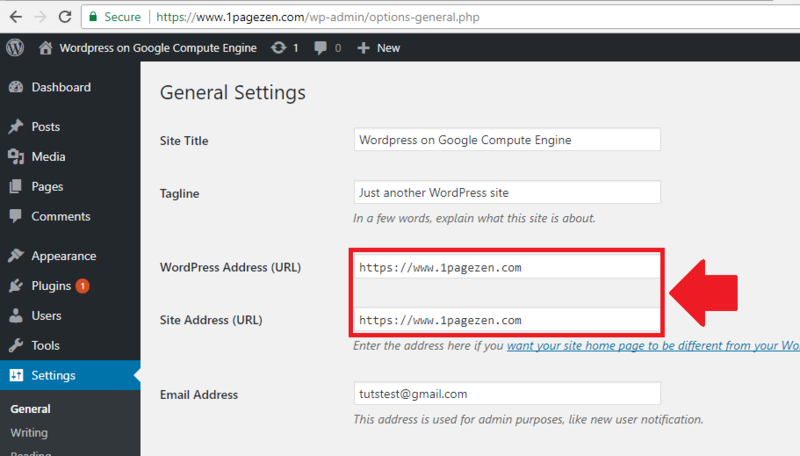 After pasting the code, remember to change the lines with the domain names from 1pagezen.com to your own domain name. But am getting only this appearing. Can you advise please? This is preventing me from completing step 7. I used this tutorial once before in the exact way and had a positive outcome. The stack is different from when the tutorial was first created. I am going to have to update it. Check out this comment regarding the lines of code that should appear in your wordpress.conf file. Try copying and pasting those lines into the file, making sure to use your own domain name in the three redirect lines. Hello , Thanks for giving tutorial , all command was work but problem is ,Not able to start apache2 server i am getting error msg . Looking for your help . I encountered the same issue and tried these commands but still encountered the same error. My site currently gives “ERR_CONNECTION_REFUSED.” Any ideas to get past this hurdle? This tutorial has been great so far! Thanks for reaching out – were you able to get the issue resolved? If the system doesn’t return any errors, I would next verify that your DNS is configured properly. You write wonderfully concise instructions. The level of detail is always spot on to not digress into things not important to the steps. The video is just icing on the cake. I have used many of your instructions to great effect but was very concerned about this change and the number of steps involved. It worked perfectly (three times for three sites). I’m glad the tutorial has worked for you. I will be working on improving the tutorial in the next few weeks, so hopefully it will be even better the next time you use it. Hey I would appreciate some help on the last part (HTTPS Redirect). I have the same the same problem as the person below me. I did everything correctly step by step twice (Deleted VM and did it again) and it’s still the same result. I entered “sudo nano /etc/apache2/sites-available/wordpress.conf” and this is what I got. My website works perfectly fine. I did what you suggested by switching to root and entered both of the commands below and I got the same result as the first one. Unrelated question, how do I leverage browser caching with google cloud? I just created a new Click-to-deploy instance and it appears that there were changes to the wordpress.conf file, as I’m seeing the same thing that you are. Also, remember to replace 1pagezen.com with your own domain name (in the code snippet). I haven’t tested this yet, so please let me know if it works. Remember, you will have to restart Apache for the changes to take effect. Regarding browser caching, I don’t have a tutorial on the subject yet but hope to in the near future. Perfect – I’m glad to hear you got it working! Thank you very much for your really helpful tutorials! I had the same problem and couldn’t access my site because of too many redirects. So I copied and pasted the above code for the wordpress.conf file. Very important: You then have to restart Apache! I know, you mentioned it, but I want to make it clear here in the comment to help others with the same problem. Hey Patric – thanks for great tips! I’m glad you were able to get it working. Just copy and paste the code. You can indent it you find it more readable, but it is not necessary. This is my third website that I am trying to create. I have done first two websites using your great tutorials. But now I faced with a problem. appears. So I am not able to go on next step. Can you please guide me to fix this issue? I’m glad to hear you’ve had success with the tutorials in the past. As far as your issue – is it possible that the contents of the file were deleted? Probably I know my mistake. When I executed this comment line, “sudo nano /etc/apache2/sites-available/wordpress.conf” I mistakenly changed “wordpress” term with my website domain name “kagitkarton”. I also record a screen video and I am adding the ling below. I hope it will help you to understand my problem. Thank you Loren. I hope I’m not disturbing you. Don’t worry about the sudo -i command that I mentioned in my previous response – this was only a workaround since we hadn’t yet identified the problem. That being said, after watching the video, it appears that there is a lot missing from your wordpress.conf file. If this is a new installation, I would simply create a new VM and try again. Otherwise, you will have to add the code from the initial configuration back into your wordpress.conf file. Another question: does your website continue to work in spite of the wordpress.conf file being nearly empty? I run the the command now and the same result. I repeated the steps few times but same result. The requested URL /mywebpage/ was not found on this server. Now, as you said I will try to create new VM and I will inform you about the result. I hope it will work. I tried all the ways but I couldn’t get any affect. At last I created new project but again same issue. So I decided to use Bitnami with a new project. I created my hosting with bitnami, my website works but at the end red not secure error appears on the browser when I enter my website. I will write this issue under related page. I followed your entire tutorial for Click-to-Deploy WordPress on Google Cloud Platform. Everything went well – including the SSL certs installation and static IP address assignment. This few days, I suddenly discovered an error message “Error establishing a database connection” whenever I tried to reach my own website (you can try and see the error message). I have not changed any settings. Google’s documentation suggested an issue with the SSL certs. I ran a SSL test but it looked ok (I’m no IT expert, so I’m not sure). Can you help me to have a look and tell me what’s wrong? This is a common error in WordPress and is likely unrelated to your SSL configuration. Whenever I experience that error, it’s because my database connection credentials aren’t defined correctly in my wp-config.php file. So the first thing I would recommend doing is opening your wp-config.php file and checking that your database connection settings are correct (hostname, password, database name, etc.). Also, do a Google search for “WordPress Error establishing a database connection” – you will find many troubleshooting tips from other users who have experienced this same issue. Is this a problem of some kind and need to be solved then how? 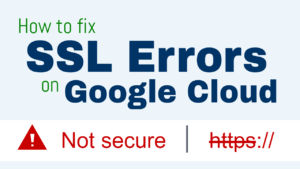 how to disable free ssl from gcloud because after installing ssl on my client site we cannot share any think to facebook, if you have any solution please guide me how to rectify this error. This is my first time on google cloud and learn lot of things form your website http://www.onepagezen.com you can say i completely install wordpress from you site but i stuck here on facebook issue, please if you have any solution how to share on facebook (client required) or how to disable https to http. Your very detailed tutorial gives me courage to pursue Google Cloud Hosting even if I’m new to this creating a WordPress website. You’ve been very responsive also to our questions which makes it more easy for us to resolve issues along the way. As a form of gratitude, I would like to raise a small issue on this tutorial that causes me errors. On Step 6, the first 2 lines of the code with the SSL certificate files has an extra spaces at the end which causes an error. A couple of comments here are related to the this issue so if you can update that part, it would prevent similar future errors and comments. Hopefully I was able to help even a little. Were you able to get your domain name integrated with your website? And thanks for the feedback – I was able to find and delete the extra spaces that you were referring to. Yes, I was able to setup my domain name with my website. Thanks to your very detailed tutorials and to your effort on answering issues we encountered. Everytime I encounter an issue I make it sure to read the comments or use CTRL + F in Chrome to search for same questions that you might have answered. Your answers to our questions helps a lot. I was on the brink of giving up Google Cloud Computing due to errors I encountered but your answers to our questions helped me solve errors along the way. Hopefully you won’t get tired of helping us with Google Cloud Computing. I’m happy to know that the comments have been valuable to you! I’ve also heard from a few other users who mentioned that they appreciated the comments at the end of each tutorial, especially when troubleshooting. I’m happy to know that people are taking advantage of this resource. Also, I’m glad to hear that you were able to push past the brink of giving up. I know how frustrating GCP and AWS can be, especially when first starting out. Thanks again for the feedback and I look forward to hearing from you in the future. It is normal that SSL will cause your website to load more slowly, but the effect should be negligible. If you are noticing a significant increase in load times after configuring SSL, it could indicate that there is another issue at play. Analyze your website on GTMetrix.com, and click on the Waterfall tab to get a breakdown of which of your website’s components are responsible for the longer than average load time. hi where can i get the cert keys to create loadblancer? Thanks for the feedback, Prem – I’m glad to hear you were able to get it working! You are amazing. 100% working 🙂 Let me know how I can return the favor. Thanks!!! Thanks for the feedback Nicolas – I’m glad you got it working! I have done those steps and it went great, but do you know how to delete/reset the SSL certificate so I can assign it to another url? There is no easy way reassign the certificate to a new URL, because your system has been configured (based on the tutorial) to serve HTTPS from your original URL. To fix the issue, you will have to first configure your website with the new domain name. After the new domain name is working properly with your website, then you can issue a new SSL certificate for that domain. After you issue certificates for the new domain, you will have to delete the old certificate paths from your default-ssl.conf file and replace them with the new certificate paths. You’ll also have to change the redirect at the top of your wordpress.conf file to point to the new domain. Hey Jaiveer – I’m glad to hear you got it working! When I do an SSL test on your domain, the SSL checker isn’t recognizing any of the Let’s Encrypt SSL certificates. What I would recommend doing is going back through the tutorial and making sure that you’ve covered all of the steps. Keep in mind that Step 6 is where you explicitly tell your server to use the newly generated certificates. Hope this information helps and let me know if you have any questions. This worked flawlessly, thank you for your time spent in putting this together! Thanks for the feedback – I’m glad to hear you were able to get the tutorial working! Another great job explaining the subject. I share Juan ‘s thoughts also, would be better to change the url’s in wordpress before the apache restart. My site went away, came back as deleted & the gcp dsahboard showed a welcome start a new project page while still showing showing my instance in the navigation menu. I hit the drop arrow & selected my instance and it would loop me back to the dashboard with the welcome page again. My website said it was deleted while displaying https with out the lock only the ! insecure page warning. I could not get the wp-admin page to load. I think this might be a chrome thing. I deleted all browser settings, signed out of my account, rebooted & the site was up, I could log in change to https & the world was right again! I did this with the earlier version. For some reason the link to the updated version was grayed out! I did notice there wasn’t any suggestion to change the permalink structure in this video. Your video’s did make this a snap to do, so thank you. Let me know what you think the problem was. I am going to be updating the tutorial soon, with updated auto-renewal instructions as well as moving the restart command to the very end of the tutorial. I’m not sure what caused your issue specifically, however, I’m glad to hear you were able to get the issue resolved. On another note, when developing on Chrome I make frequent use of the Strong Proxy extension and free proxy services such as hide.me. This serves as a way to bypass the caching functionality in your Chrome browser without having to repeatedly edit your browser settings. It’s possible you’ll find these tools helpful if you’re not already using them. Thanks again for the feedback, and talk to you soon. Really looking forward to the updated tutorial, Joe! It’s great that it will include auto-renewal instructions as well. Wonder if it will include instructions for wildcard certificates too? Sounds good – I’m glad you’re looking forward to it. I will include a note on Wildcard too: all it takes is changing the certificate issuing command. any news on the updated version of this fantastic tutorial? Including, especially: instructions for correctly setting up wildcard certificates along with auto-renewal? I haven’t started working on it yet. I’m going to be publishing a CDN tutorial and a caching tutorial in the next few weeks. After that is when I will get started on the tutorial updates. In the meantime, if you have any specific questions or run into any errors – please let me know. Yes, we really wonder what we should do right now. We have used your tutorials exact steps to set up SSL for sites in WordPress Multisite Network. The only thing we needed to do, that is not in this tutorial, is configuration that needed to be done with WPMU DEVS Domain Mapping plugin, in order for every domain and subdomain in the network to get SSL. WMPU DEVS plugin also makes it possible to selectively turn on or off SSL for individual sites in the network, really useful function. We have several sites with full domain names (like: domain1.com, domain2.com, domain3.com) and large number of sites that exist only with subdomain names (subdomain1.domain1.com, subdomain2.domain1com… subdomain101.domain1.com). Our biggest problem with the current tutorial is that we have a large (and growing) number of subdomains, and we need to separately add all those subdomains according to this tutorial, every time we add new subdomain to our network. So if we add subdomain102.domain1.com, we need to redo everything each and every time for all domains and subdomain, and the number of especially subdomains is growing fast. This is where the new wildcard Let’s Encrypt wildcard functionality would really be of tremendous help. It is becoming impossible otherwise. So what we concretely wonder about: where do we go from here? In other words: how do we go from the current configuration to the wildcard based, self-updating configuration instead, from the current position we’re in, step by step, without jeopardizing the network or risking downtime (there are many live sites affected). It sounds like you have the ideal use case for a Wildcard certificate. I would recommend that you create a new VM and first get comfortable implementing Wildcard certificates. See if you can get it working as intended with a similar configuration as you have now (use a test domain). If you can get it working correctly, then reissue and overwrite the existing certificates with the wildcard certificates. The certificate issuing process for wildcard should be similar to the existing process. Not sure what isn’t working. Tried and followed the same step twice, and still not able to get it working. The entire site is down. Were you able the get the website working? Please share your domain name (you can send it via the contact form on the website if you prefer), and I will take a look. Will you please help me solve this? Thanks! Certbot only allows you to request a certain amount of certificates per day, per domain. It appears that you made too many requests, so Let’s Encrypt has temporarily disabled new certificate requests for that domain. The only thing you can do is wait. Check out the link in the error message for more information about how long you have to wait before you can make a new request. I am not using wordpress but i have LAMP setup on my Google cloud and i would like to have free SSL for my domain and for all my sub domains. So by following this guide can i achieve that ? Yes – the tutorial will work for this use case. Just make sure the webroot (var/www/html/) is the same, although it usually will be in ~95% of cases. Let me know if you have any questions or encounter any issues. Yes, the root directory is var/www/html Also I just want to ask you the tutorial will work for wildcard also ? Anyways – I wouldn’t recommend following the instructions above as they haven’t been tested, but they should give you a general idea of how a wildcard configuration could be implemented. Also check out this thread from Let’s Encrypt for more information. Use at your own risk, and let me know if you have any questions. That looks right. And you’re using the WordPress Click-to-deploy solution offered through the cloud solutions library? What is the output when you run the following command? I’ve checked and there is no www directory in var. This tutorial is for WordPress Click-to-deploy, not Bitnami. For the Bitnami version (which you are using), check out this tutorial here. How to restrict wp-admin page access..adding only allow <> not working ..is it become it’s hosted in gcp? There are numerous solutions such as implementing a Captcha or disabling access after too many failed login attempts. Deciding which solution to implement depends on what you’re trying to accomplish. Please provide additional details and I will see how I can help. you saved my time. Been searching for a solution on various forums… this served the purpose. I have a question. How to increase file upload size on google cloud? You have one tutorial for bitnami. Is it same for one click deploy ? The tutorial to increase file-upload size also has instructions for Click-to-deploy. Thanks for the feedback Rafael. Are you saying that it wasn’t working when you had the quotation marks? This is the first I’ve heard of this! Thank you for those useful tutorials! I followed these steps, and https is working properly for my website. However, I can’t login to enter wp-admin. If I enter username and pass; ERROR: The password you entered for the username user is incorrect. If I click on “lost your password” and enter my email: ERROR: There is no user registered with that email address. Did you use the All-in-One WP Migration plugin? If you did, you will need to use the password of the site that was migrated to login to WordPress. Also, your email won’t work because you will need to configure SMTP; either way, the SSL configuration would not affect your WordPress login credentials, so there is another issue at play. I had a question though and I’m sure you already posted it, but I cannot find the information I need anywhere. I have a 3rd party SSL certificate and I want to just apply it to google cloud wordpress. I have a trouble to understand how to do it. The process of installing 3rd party SSL is much different from using Let’s Encrypt SSL. You will have to issue a CSR, send the CSR to your 3rd party SSL prodvider, then wait for them to issue the certificates. Once they issue the certificates, you will download them, then upload them to your server, then include the file paths to their location on your server exactly like in step 6 of this tutorial. Other than that, the other instructions in this tutorial will be the same. Sir, You are Awesome! Every Step worked perfectly for me and now i am running my new blog with https://. Thanks a ton! Our website is on google cloud with a load balancer. We followed your tutorial to do everything except load balancing. Our site have problem with https redirects. We tried everything as per your post (adding redirect to wordpress.conf), but not working. Please help. Thank You. I don’t offer support for load balancing configurations, but you may find this thread useful. I’m having trouble with my Multi-site installation. all of my subsites have their own domain registered, it seems the forced redirect to the main site has something to do with the SSL. Any Help would be great, the plugins haven’t worked for me. Check out this section of the guide from Bitnami on how to configure Mutisite with multiple different domain names. For SSL, issue a single certificate with all of the domains listed in that single certificate. I hope to have a multisite tutorial available in the near future. I fixed it. I had to update the https.conf. I had to change overide from allow none to allow all. This would allow the .htacess file overide the virtual host for the subsites. Awesome – I’m glad to hear you were able to get the issue resolved. Thank you for the tutorial. I did exactly as mentioned in the tutorial, but could not get to the last step for changing the settings in wordpress admin account. Each time I was trying to login to wordpress admin, the page showed error site redirected too many times. The same is the case when I try to open my website. Please provide some additional details regarding the error message that you’re seeing and I will see how I can help! http://www.fineaz.co.in redirected you too many times. Though d page shows HTTPS, but the page does not open, neither the green lock sign appears. P lease note, I was unable to carry out d last step since wordpress admin page stopped working. This issue is usually caused by having multiple redirects in your conf files. Where did you configure your redirects? There should only be one and it should be at the top of your wordpress.conf file (step 7). Run the command cd /etc/apache2/sites-available/ to list your conf files. Open up each one using the nano command and make sure that there aren’t any additional redirects already included in the files. Also – do a search for the your htaccess file, open it, and make sure there isn’t a redirect included therein. I did the exact setu and now I have permalink problem. I cannot access any other page than my homepage with permalink to postname . I tried may different repair on the htaccess file and it is no working, I accessed the phpmyadmin DB and looked around to fing no solutions there. Any idea why I would get this error. I added inside the default-ssl.conf the line suggested and it worked right away. I’m glad you were able to get the issue resolved. Hi, your instructions worked perfectly, and I have been able to setup a site with SSL. I’m trying to take this one step further, to create an autoscaling, autohealing, loadbalanced wordpress site that also uses Google CDN. I am able to do all of it, and the https version of the site works well. However, if you enter just the naked domain name in the browser, it gives a 404 error. This appears to be a known issue (see https://stackoverflow.com/questions/38201969/redirecting-http-to-https-in-google-cloud/38202272). Basically Google cloud loadbalancer currently can’t force http to https. However, there’s a workaround to that, as is mentioned in the stackoverflow post above. You’re supposed to add the following code to the .htaccess file. I have done that, and the naked domain now does load, however there’s no padlock. Do you have any suggestions as to what I can do to fix this? I’ve had issues configuring GCP’s load balancers in the past, and it was usually a similar type of problem where the www-version of the domain wasn’t resolving properly. Access to Font at ‘https://riderzone.review/wp-content/themes/skil/assets/fonts/fontawesome-webfont.woff2?v=4.5.0’ from origin ‘http://riderzone.review’ has been blocked by CORS policy: No ‘Access-Control-Allow-Origin’ header is present on the requested resource. Origin ‘http://riderzone.review’ is therefore not allowed access. I did a Google search on the error and here’s what I found: Resource 1 and Resource 2. Also, this Github gist might be exactly what you’re looking for. Let me know if you’re able to get it working! Thanks a lot for your reply, it was a little dumb of me not to Inspect the page on Chrome. Also, the site URL inside WordPress for me did not have WWW. Now that I have changed these settings, it’s working. Take a look at riderzone.review if you’d like to try. I have noticed a new issue though. Running a speed test on GTmetrix, the site now loads slower than it used to before I made this setup. I had expected the load time to go below 3 seconds, it has gone above 5! Surprising considering the fact that I’m using Google CDN. I’m happy to hear you resolved the issue. And I took a look at the GTMetrix score and it wasn’t recognizing the CDN. An alternative configuration is to serve all of your WordPress media from a bucket which is configured with Google Cloud CDN. This would cut back on the load times for international visitors, as media files generally account for the higher load times. If you’re able to get the CDN working right, please let me know the solution. Mistakenly installed this in my LAMP installation. Now it’s showing insecure badge lock.. I need to remove or revoke this certificate. I have deleted all relevant files in /letsencrypt and /ssl files but it’s still showing the same.. Is there a way I can remove/revoke this certificate? These instructions will work for any LAMP installation. The instructions might be slightly different, but the key concepts are the same. If you want to remove the certificate, you can simply comment them out, or remove their file paths from your server’s conf file. Make sure to un-comment the dummy (snakeoil) certificates when you do this. Hi, thank you very much for this tutorial, it was a great help. I have one problem however. None of the sites I used this on will auto renew their certs. I followed the tutorial to a tee every time. I created a separate tutorial on how to configure auto-renewal for Let’s Encrypt SSL certificates which you can view here. Feel free to reach out to me if you have any questions regarding the tutorial! Will you be releasing a bitnami multisite tutorial anytime soon? Yes I will be. That’s the next tutorial I will be doing (Bitnami). Hey, great article helped me a lot. 1 issue though I could never find the wordpress.conf file. I looked everywhere. My website is not redirecting non www to www or vise versa. Any idea what I can do to resolve this issue? Yes, I’m using multisite, but I’m not using multiple domains. In fact, it is just one domain because my setting is to use subdirectory and not subdomain. As I read a Standard SSL certificate can be used for Multisite installs with subdirectory paths such as https://www.your-site.com/site1/ and https://www.your-site.com/site2. Based on that, I think this tutorial fits my website, but I’m guessing I’m doing something wrong. Your /site1/ and /site2/ directories would be covered under the SSL certificate because they are served from your SSL-enabled domain. For that reason, you won’t have to include these additional URLs in your certificates. The only instance when you would need to included them is if you had enabled subdomains such as https://www.site1.yoursite.com. As far as your issue, I’m not sure what it could be. Configuring multisite is not for beginners and there are a million things that can go wrong, so you will need to troubleshoot. If you’re using the Bitnami Multisite stack, I would follow their documentation – that’s helped me configure Multsisite in the past. Bitnami does not allow subdirectories. In that case, you could use these instructions for installing multiple WordPress modules on the same stack. Unfortunately the documentation doesn’t provide instructions on how to integrate with your existing stack, so you may have to look around for online resources. I’ve never configure multiple WordPress installations in separate sub-directories, so it’s not something I have much experience with it. If you’re able to get it to work, please share your process – I know myself and many other users would be interested to learn. I’m trying bitnami multiple wordpress modules in order to check if the users can use the same login section for all wordpress installation. I’m still trying to figure out how to set SSL on WordPress click-to-deploy using multisite with subdirectory (not a subdomain). If you have any clue, please let me know. Run the command cd /var/log/ then cat syslog – this will print any errors in your Apache server. Additionally, try restarting your Apache server. If it can’t restart due to a configuration issue, it will print the error to the terminal. Hi Leron, thanks again for the tutorial. But I don’t have extra space here. What could I do? This error message is saying that there’s an issue with the directives in your wordpress.conf file on line 6. You will have to look online at resources to find the correct directives to use at the top of your wordpress.conf file. Unfortunately, the configuration will be different from what is instructed in this tutorial because you are configuring your server to handle multiple domains. To be successful with multisite, utilize a Domain Mapping plugin and check out the Bitnami multisite documentation for step-by-step instructions. Based on the error message, it appears that certbot isn’t installed. Make sure you’re installing to your home directory, so run the command cd before running the command to install certbot. After doing this, try doing the tutorial again from step 1. Remember your can copy and paste the commands directly from the tutorial, but only the commands in the grey boxes. Any text that you copy and paste from outside of the grey text boxes may cause formatting issues. If this doesn’t work, please submit follow-up comments to the WP-Cloud-Support page and I will assist you there. Hello, Thanks so much your website has helped me a lot. I have a question because this tutorial has caused some issues. However this has taken down my website. When I enter my WordPress GCP IP address into a browser, it forwards to my old placeholder URL. Why is my IP address forwarding to this old URL? As you can imagine, I can no longer see my website and the WordPress backend no longer works. If you deleted the old certificates and updated your DNS, you should be able to reissue new certificates with your new domain without any issues. If your browser is loading you old page (showing old URL), it is likely a caching issue with your browser, not with your DNS. To fix the issue, try viewing the site through a proxy service such as Hide.me, and see if it loads the ‘new’ website. I followed all the steps, but had to open and close the SSH window a few times to get the commands to work. I wasn’t sure if the ctrl o and ctrl x were working. Most of the time these errors occur because there is a syntax error in one of your config files. I would recommend you go back through the tutorial and make sure that your virtualhost headings in your wordpress.conf and default-ssl.conf match the headings from the images given in the tutorial. Give it a look and let me know what you find. Also, let me know if you have any questions. how do i edit the default-ssl.conf file? i do have a syntax error line 39. Feb 13 11:13:25 wordpress-1-vm apache2: Starting web server: apache2 failed! Feb 13 11:13:25 wordpress-1-vm apache2: The apache2 configtest failed. … (warning). Feb 13 11:13:25 wordpress-1-vm apache2: Action ‘configtest’ failed. Feb 13 11:13:25 wordpress-1-vm apache2: The Apache error log may have more information. Feb 13 11:13:25 wordpress-1-vm systemd: Failed to start LSB: Apache2 web server. Feb 13 11:13:25 wordpress-1-vm systemd: Unit apache2.service entered failed state. In step 6 of the tutorial, we walk through how to edit the default-ssl.conf file. Line 39 is most likely one of the lines that contains the path to one of your 3 certificate files. The problem is most likely because you have extra spacing after the certificate file path. In Apache, you are not allowed to have extra “spaces” after the file path – so go to that location and hit the backspace key a few times until it lines up next to the end of the text. Check it out and let me know what you find. But I noticed I don’t have the green lock ‘secure’ , only the is there anything else I have missed? You’re almost there. Now you need to fix the insecure content errors on your website. I go over how to do that in this tutorial. YAY!! All fixed Thank you Joe! There is an error with your Apache server configuration. If you try restarting the server, are you notified of an error message? Please, any ideas what can be the issue? Where are you seeing that message? Does your website load properly? [warn] The apache2 configtest failed. Not doing anything. … (warning). If you have any ideas, please, please let me know… feel free to contact me via email too if you wish. Open up your /etc/apache2/sites-enabled/default-ssl.conf file and go to line 42. On line 42, there is probably the path to one of your SSL certificate files. Now – make sure there are no extra space characters after the line. Just use your arrow key to move your selector over the entire line, and when you get to the end, your selector should jump to the next line. The extra spacing is likely what is causing the error, so use backspace to delete any extra space characters at the end of the line. Also, make sure there is no spacing after either of the other 2 lines. Please do this then restart your server and try again. This is a common issue that occurs when you recently pointed your domain name to Google Cloud but the domain name servers haven’t had enough time to propagate. So – if your DNS is configured properly, I would wait an hour before trying again. If it doesn’t work after an hour or so, it typically means that there is an error in your DNS configuration. If you got it to work – great. If not, try again and let me know if you run in to any issues. Thanks, The issue has been resolved now. Great Karan – I’m glad you’ve resolved the issue! To deactivate the certificates, you can either put a # next to the certificate paths, or completely remove them – depending on your preference. To remove Let’s Encrypt files from your disk, use the rm command to delete the letsencrypt folder from your /etc/ directory. The steps to configure Comodo certificates are much different, but whoever you’re buying the certificate from will have instructions on their website on how to install Comodo certificates on Apache. Why not enable the WordPress URLs before setting the HTTPS redirects? The way you have it interfered with the CSS rendering of my setup and wouldn’t let me access the wp-admin panel. You make a very good point, and there isn’t a reason behind it. I will look into your suggestion for improving the tutorial, and will give it a test run with configuring URL’s before the redirect. This error typically means that your DNS changes still haven’t taken affect. Take a look at this tutorial and make sure you followed the instructions properly. Please do a video tutorial on how to install cpanel and whm on google cloud plateform. I will add that to the list of tutorials. Worked perfectly! Thank you so very much! Why are you changing the root directory to var/html/.tmb? And the command is ./certbot-auto renew – try running that command. If you want, copy and paste the certbot-auto command that you entered and I will take a look. And it’s not a problem that you entered many domains on your certificate – I think you’are allowed up to 100 or so, so you can still add more if needed. Awesome video and instructions. I am getting away from the plugin WP-Encrypt because of the issues I was experiencing. Looking to deploy this solution for my clients. One issue though , I am receiving a “Type: unauthorized / Detail: Invalid response from” when running “./certbot-auto certonly –webroot -w /var/www/html/ -d mydomain.com -d http://www.mydomain.com“. My dns info is all good, and I actually manage it through Google Domains. The ‘a’ record points to the instance external ip in compute engine. Would this be related to my previous install of WP-Encrypt? I am somewhat lost at this point. Any suggestions would be great. Thanks. This typically occurs if your nameservers aren’t properly pointing to your A record in your Cloud DNS, usually because the nameservers were changed recently. I would give it some time. If it still doesn’t work after a few hours, it may be a problem that I have never come across. Hi Leron, I had commented on other tutorial thread about 302 header code. After doing all these thing, I’m unable to access phpmyadmin or site both. I’m also unable to change the wordpress url (http to https). What should I do to change them. How to access phpmyadmin through SSH browser. Where I found all command for SSH for GCP. Problem has been solved. I think its take some time to configure all thing. Thank you very much. How do I serve both http and https versions of my site? The best way to do it depends on what you are trying to accomplish by serving both the http and https versions of your site. You can check out this article for more information. Its working, I did not notice the typo, thanks!! Could you please help me about that ? This error means that your Cloud DNS isn’t properly configured, and that your domain isn’t being validated. Go back and check out this tutorial and make sure that you configured all of the steps properly. Thak you for your consideration. But I am afraid, all the DNS settigns are right, they are exactly the way that you wrote. Also my website has already been running for 3 months. Additionally, I just wanted to add free SSL , but it does not work :(. What else can I try ? If you are not so bussy, I can let you to connect my computer via Teamveaver or remotely. Ok . I fixed it. Thanks anyway. What did you do? I am having the same issue. Thanks in advance. I have not encountered this error before. However, check out this link for more information on how to solve the issue. This error occurs when you’ve entered a certificate issuing command for a certain set of domains within a short period of time. You may have to wait awhile before running the certificate issuing command again. Check out this article on rate limits for more information. Thank you for all your useful tutorials…………. i’m big fans of your’s. You mentioned that the code checks for a cert renewals 2 times per day. When does it actually renew the cert? Is it daily or a few days before expiration? I guess I’m a little confused because certs last 3 months and i would assume that a few days before cert expiration that it would renew the cert. Is there a manual way to renew the cert just in case too? In the first version of the SSL tutorials, the certbot-auto script was saved in the /tmp directory. Because of this, many users faced issues with their certificates not auto-renewing properly. I initially addressed this issue with Isabel, and we devised a solution to the problem which you can view here. Let me know if you have any issues with the instructions, or if something doesn’t work for you. I have the click to deploy version. The certificates expired and when I manually entered the ./certbot-auto renew command it worked. Why is the cron not working then? Check out the new tutorial on configuring auto-renewal. Hi, great tutorial. It worked perfectly for my www subdomain. Any idea why it wont let me generate a certificate for a subdomain? Quick note: my second sub-domain is located in another server therefore it has different ip address. That’s what is causing the DNS issue. You have to add all of the domains/subdomains for your website in a single certificate issuing command. If you want to secure additional subdomains for a website that already has SSL configured, you’ll have to run a different command or reissue the original command including the additional subdomains that you want to secure. The error that you’re seeing means there is an issue with your Cloud DNS configuration. I followed all your steps of this tutorial and it worked just like you showed in the video. It was wonderful. I really like how you explained everything. I think this is one of the most technical things I have ever done on a computer and at first I was skeptical of it being something easy or straightforward, so that’s why I double checked and even triple checked that everything I was doing was exactly like you did. And when it worked I was really happy. Thank you! To anyone following this tutorial, I want to say that the best thing you want to do is pay a lot of attention to every step and make sure you follow it precisely like it’s said. It worked for me. I am glad to hear that the tutorial worked for you, and thanks for sharing your tips for success! Thank you for all your useful tutorials! I followed your instructions and installed SSL certificates, but they have now expired. The cron task did not auto-renew. Please help me renew them. Can’t even get the ‘dry run’ to work. You aren’t the first person to have the issue – which is part of the reason why I launched the new version of the tutorial. Check out my reply to Isabel here for the solution to the problem. Thank you for your excellent tutorials. Or should I create another wordpress.conf file and place the second site’s variables there? I skipped steps 2,5 and 6 because I had already done them on the first install. Don’t create another wordpress.conf file. With multisite configurations, your wordpress.conf file needs to be configured for the PRIMARY domain in your multisite configuration. The additional domains, whether they are top-level or sub-domains, should be mapped from the front-end using a domain mapping plugin. Check out this Bitnami documentation for additional instructions. Also – the configuration instructions are nearly identical regardless of whether you’re using the Bitnami or Click-to-Deploy WordPress stack. Then I can’t go further process. Do you have any suggestion for this issue? Oct 27 16:30:58 wordpress-multisite-1-vm apachectl: Action ‘stop’ failed. Oct 27 16:30:58 wordpress-multisite-1-vm apachectl: The Apache error log may have more information. Oct 27 16:30:59 wordpress-multisite-1-vm systemd: Stopped The Apache HTTP Server. Oct 27 16:30:59 wordpress-multisite-1-vm systemd: apache2.service: Unit entered failed state. Oct 27 16:30:59 wordpress-multisite-1-vm systemd: apache2.service: Failed with result ‘exit-code’. Oct 27 16:30:59 wordpress-multisite-1-vm apachectl: Action ‘start’ failed. Oct 27 16:30:59 wordpress-multisite-1-vm apachectl: The Apache error log may have more information. Oct 27 16:30:59 wordpress-multisite-1-vm systemd: Failed to start The Apache HTTP Server. There is a syntax error in your wordpress.conf file; on line 2 from what it looks like. This is the reason why your Apache service is failing to restart. If you haven’t yet resolved the issue, you can copy and paste the top half of your .conf file into the comments and I will check for anything unusual. I am having the same problem above. Aug 16 09:54:12 wordpressjireh-vm apachectl: Action ‘stop’ failed. Aug 16 09:54:12 wordpressjireh-vm apachectl: The Apache error log may have more information. Aug 16 09:54:12 wordpressjireh-vm systemd: Stopped The Apache HTTP Server. Aug 16 09:54:12 wordpressjireh-vm systemd: apache2.service: Unit entered failed state. Aug 16 09:54:12 wordpressjireh-vm systemd: apache2.service: Failed with result ‘exit-code’. Appreciate your help! Thanks alot! Check out this comment. Copy and paste the code from the comment into your wordpress.conf file, and see if that fixes the problem. Don’t forget to substitute 1pagezen.com with your own domain name. THANK YOUUUUUU!!!! IT WORKED!!! You are the man! I am not sure the multisite configuration has a wordpress.conf file located in the same directory as a standalone Click-to-Deploy configuration. Thanks for pointing me this updated tutorial, followed it and got the SSL setup on my first website within 5 minutes. Amazing stuff. Just had one question in mind, I’ve already made a snapshot of my VM after the SSL was setup so in future say if I restore this snapshot or maybe clone it and then point the static IP i was using for this VM to the cloned VM, will the SSL function properly on the cloned VM right away or will I have to do this again? I am glad the tutorial worked for you! If you are restoring the website snapshot to the existing VM, it should work just as normal. If you restore the snapshot to a new VM it would have to have the same DNS configuration that was used when originally configuring the certificates. It may or may not work out of the box, if not, you would just have to make some basic adjustments to your DNS and Apache. It looks like you could offload the SSL to that, but I’m not sure if you can do SSL with letsencrypt. I’d like to be able to scale up if there’s a crazy spike in traffic, but scale back if nothing’s happening. I have been working on a load balancing tutorial, and hope to have it released soon. The one I am currently working on is a cross region load balancer to distribute traffic to instances based on their proximity to the user. However, I will also do a tutorial on the scenario you described, in which new instances would be automatically deployed to handle sudden spikes in traffic based on CPU utilization. Another issue I am trying to justify is the cost of running the load balancer service, which ended up being significant (~$20-$40/month). This would arguably make the service impractical for anything except for large (and profitable) sites that see heavy levels of traffic. You again saved me with SSL setup. I was trying to use Cloudflare to setup its free SSL for my client’s GCP hosted site, but it didn’t work properly after countless tries. Decided to try this tutorial and it all went exactly the same like you explained. I am glad to know that the tutorial was helpful for you! Thanks for taking the time to write about your experience with CloudFlare vs. the tutorial. following your tutorial, it stops at step 3. before the console asks me for email address or to agree, etc. with the same error I have seen others mention on this page and your youtube channel. a solution would help many 🙂 Your help is appreciated. Your tutorials are valuable! I had someone else experience that error recently. I am going to try and re-create the error on a test account and see what I can find. the issue was following the wrong “version” of your tutorial. For me, I needed the click to deploy Bitnami version of SSL tutorial. after locating that – your steps were flawless. So anytime in the future other users are experiencing that same error (saw a few others post it), the answer is just wrong tut. Outstanding work on these tuts! Lifesaver!! I am glad you were able to get the issue resolved. Can you please explain your solution a bit more explicitly. What is the right tutorial and would you please be a little more open while saying “click to deploy Bitnami version of SSL tutorial” ? It looks like your certificates are configured properly for your domain mytraveltrips.in – you just need to fix the mixed content errors. If you want me to look at the /var/www/html/ error, copy and paste the contents of your SSH window into the comments so that I can see the command that is causing the error. I know lots of people (including myself) will be thrilled to have wildcard capability. I agree that it will be an invaluable tool for WP multisite users! Letsencrypt wildcard capability in now live! Thanks a lot for your awesome tutorials, Joe! I haven’t played around with it yet, but it looks promising. I was able to figure it out. I was missing a closing “>” in one of the config files. Ooops! This was a huge help! Really great resource! I am glad that you were able to resolve the issue and get your website started again! drozdandpartners.com uses an unsupported protocol. Could you give an advice on how it can be fixed. Which web browser and version are you using? At the time I tested on Chrome, Firefox and even IE. A few hours later the system became operational. Upon examining the GCP it turned out that the entire system was down for this period of time https://ufile.io/agzjn. Anyway, thank you so much for the great tutorial. It is hard to find videos on this topic with such clarity. Thank you for following up to notify me that the error had to do with GCP. Hi, I found this tutorial very easy to follow, greatly detailed. I have tried to reproduce it for another app from Bitnami ( Mautic) any idea of what I should adapt ? because it failed so far. This tutorial will not work with Bitnami configurations because the directory structure is different. 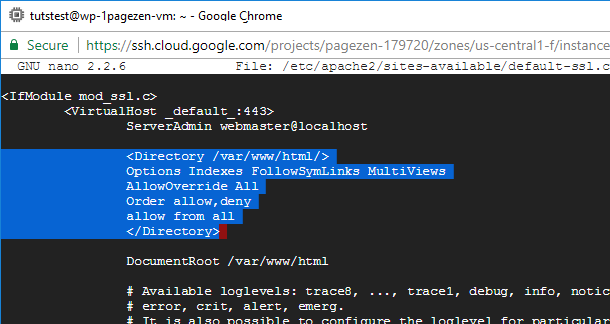 This tutorial works for the Click-to-Deploy version of WordPress on GCP and most other Apache configurations with a similar directory structure. If you want to install SSL for a Bitnami application, try this tutorial. The instructions will be nearly identical – however, I can’t say for certain. What did you think of this revised version of the Click-to-Deploy SSL certificate tutorial? my site completely gone down after this process what should i do? What is the error message that you are seeing?